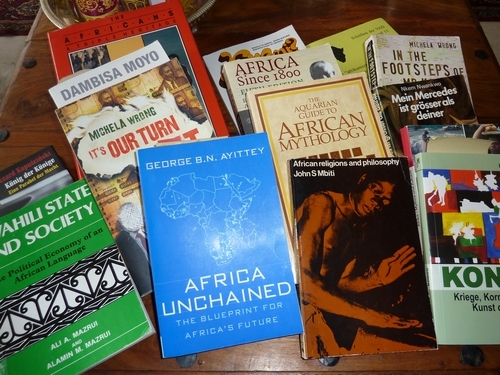 Why are there books (like the selection pictured above) & online publications on post & neo-coloniaslim in Africa as well as important recent developments on the African continent on one hand IF on the other hand I am still terribly at unease writing about “the Africans”? It’s not just the term “the Africans”, but also my arrogance to write about a third party. I just found myself deleting an e-mail I had written to a client explainig the use of social media platforms by “the Africans”, because: who am I to explain e.g. what motivates “the Africans” in using social media tools (unless we are talking about Facebook Zero and other free stuff / communities)? Would my reader be prepared enough to spot the difference between the stuff I know (facts), I assume (observations) and define as a conclusion? Could the term “the Africans” only be possible when we’re also using “the Europeans”? Are these terms only used outside their initial territory? My passport says I am German and I often also act that way, but to be honest: I know more about “the Africans” than about “the Europeans”. Does this qualify me to write an e-mail about “the Africans” – if instead I am maybe only talking about a certain age group from a region or about common user behaviour that’s rooted deep down in a historical context (like the lack of Intellectual Property Rights as argued by J.Shikwati & others)? And: is this self-criticism a typical German thing? “The Africans” have long been assumed that they do not have a voice and it is only the others who can tell their story. Such a sad state of affairs but what is worse is that these books will top best-selling lists not only in New York, London, Berlin and Tokyo but also Nairobi, Cape Town, Johannesburg and Lagos plus many more.